The Hudson Valley Farm Hub participated in Black History Month Kingston, a commemoration celebrating the African-American legacy, this year with “Land in Black Hands” an engaging public discussion held February 17th at The Church House in downtown Kingston. 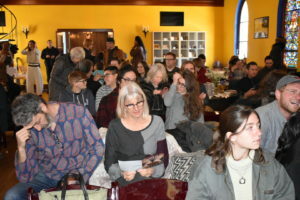 The discussion, guided by Çaca Yvaire, representing Northeast Farmers of Colors Land Trust, drew a standing room only crowd and featured farmers and community activists Ed Whitfield, Karen Washington and Jalal Sabur. The Feb. 17 panel discussion draws a large crowd at The Church in Kingston. The event, co-sponsored by the Farm Hub, The Kingston Land Trust, Scenic Hudson and live-streamed by Radio Kingston, included discussion about the “commons” as a resource for the community, reparations, and continued educational development for new and experienced black farmers. The engaging panel discussion was followed by questions from the audience. The “Land in Black Hands” event featured a number of local black-owned businesses; the cupcakes served during the panel were made by Sharon’s Cakes, and local Jamaican restaurant, Top Taste catered a post-event dinner at The Lace Mill for organizers and panelists. “Land in Black Hands” was one of many events forming Black History Month Kingston. The month-long celebration included 35 events this year, with highlights including a community dinner attended by over 250 people. 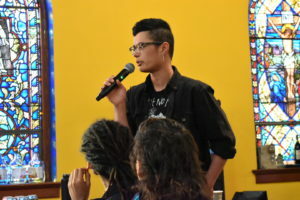 “I would say just to be able to open up that conversation of land in black hands is so important, because land is one of the most important things you can own in this country. It is a critical conversation that needs to be had all year around,” says Frank Waters, a lead organizer of Black History Month Kingston. Featured image above: Left, moderator Çaca Yvaire listens as panelist Karen Washington of Rise and Root Farm shares her views on farming and land ownership.